Home » What’s your child up to online? What’s your child up to online? I get hundreds of press releases and most don’t register with me but one this week from AVG Technologies did catch my eye. It was all about Internet security for toddlers and young children especially where they are using connected toys and services. Personally I don’t let my children have access to YouTube when I’m not around because I don’t feel some of the adverts are suitable for the age group that the content is aimed at. I’ve decided to pay extra for content and get it from Amazon and iTunes rather than risk inappropriate and upsetting adverts to be seen. The study reveals the amount of time today’s kids are spending online and the impact of internet-connected toys on their increasing screen time. 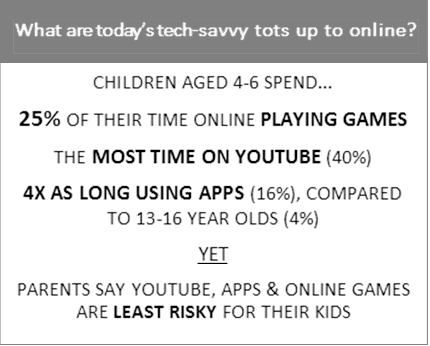 So, with internet-enabled toys – or ‘Connected Cuddlies’ – topping charts this Christmas it’s likely that these ‘soft toys’ could significantly increase the 2,000+ hours online kids are already enjoying. It also raises the question of the kind of connected services these toys will allow children to access. As such, AVG is calling for parents to be increasingly aware of the type of toys – and subsequent connected commitments – they’re buying their children this holiday season. In a future blog I’ll look at how you can monitor your home Internet connection to see what is being sent and received into and out of your house.